How very classy. They ask us to be tolerant, but burn the American flag. How very leftist of them! 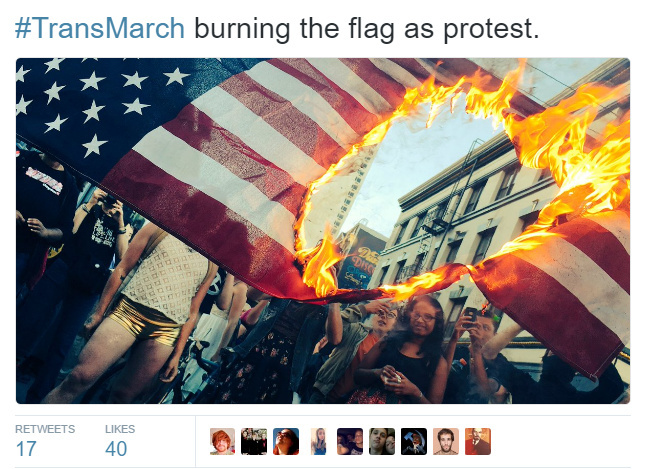 A video recorded by a Twitter user shows transgender activists burning the American flag at a march in San Francisco, Townhall reports. Twitter user “Mx Emily Rose,” who later tweeted that she did not play a role in the flag burning, was present at the march and recorded the incident. The video shows marchers setting the flag ablaze while others cheer in the background. While burning the American flag is legal, it’s not exactly the best optics for a group seeking increased acceptance into society. It does, however, beg the question as to where these activists would rather live. Transgender people in the U.S. have many more rights here than they do in many other countries, and are freely able to march and assemble as they did in San Francisco without fear of being put into jail for doing so. Not all LGBT people can say that. The U.S. is one of approximately 20 countries where a person is free to marry someone else regardless of gender identity. Conversely, homosexuality is punishable by death in 10 countries and is illegal in 73.